It wasn’t the shooting last month at Marjory Stoneman Douglas High School that spurned senior Emma Hughes into organizing a school walkout in Brunswick. It was a bomb threat, just days later, at Woodside Elementary School in nearby Topsham. “I babysit for kids that go to that school," Hughes says. "And for me, it became very real, and very quick and very sudden." Speaking at a local coffee shop, Hughes says she was in the lunchroom at Brunswick High School when she heard about the bomb threat. She says she immediately ran into a hallway and called the students' mother, to see if they were safe. Since the Parkland shootings, dozens of other threats have been made to schools from Farmington to Ellsworth. Hughes says this has all created a "new normal" of unease and worry for her and her friends. Thursday morning, hundreds of students in towns from Paris to Brunswick added their voices to the movement. At Oxford Hills Comprehensive High School, dozens of students left their classes at 10 a.m. and walked outside. Around them, school officials were on guard with about a dozen police officers on hand to keep watch. Last week, school administrators told students that they would be allowed to walk out of school and use the time to remember the victims of the Parkland shooting. But they were warned that if they stayed outside after the 17 minutes, one minute for each of the victims, and began to protest, the students would be punished. About two dozen students did stay outside. They brought out signs saying, "Gun Violence is an Epidemic" and "Thoughts and Prayers Don't Save Lives. Gun Reform Will." "No more thoughts! No more prayers! Time for action!" they chanted. The school says those students will face consequences of some sort in the weeks to come. One protest organizer, senior Jade Keene, says she's expecting an in-school suspension. Keene says the number one priority for her and other students is changing gun laws and adding stricter policies, such as universal background checks. "Gun control, mental health issues, bullying in schools, school safety in general," Keene says. "Those are all things that need to happen. But gun control is the one that can be easily solved." By the end of the day, there was some change, at least locally. Following the protest, about a dozen Oxford Hills students gathered with police officers and administrators to talk about how to make their school safer. They discussed bullying, as well as online and in-person threats, some involving guns. Senior Tasker Winslow told Principal Ted Moccia that he feels students are often left under-informed about threats to the school. "I also, I feel unsafe when I don't know what's going on," Winslow said. "So I think adults need to be kept in and have this relationship with kids. But to an extent..."
"So what can be shared, need to be shared," Principal Ted Moccia said. "And we don't do a great job of that, I'll agree with you," Moccia said. Following the discussion, Principal Moccia was already looking to change school policy. Moccia says he wants to open up communication at the school through weekly lunch forums where students can sit down with administrators. He also wants to create an anonymous tip line, so students can feel comfortable speaking up if they see something they're concerned about. "It's going to take a little bit of me meeting with my administration to look at what's possible and see some next steps," Moccia says. Students say that they don't expect their activism will end with these walkouts. Many say they're now looking at new ways of getting involved – volunteering for political campaigns and participating in local caucuses. 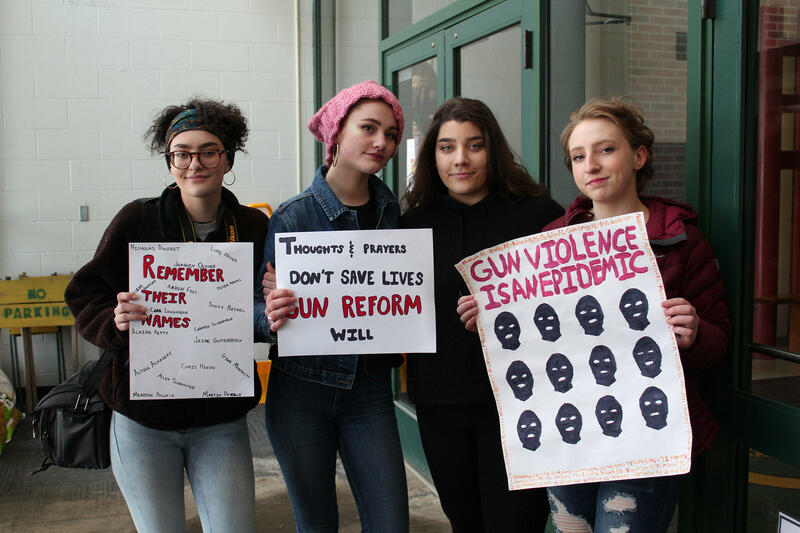 Students at Oxford Hills say they're trying to motivate their peers to action through in-school voter registration events and letter-writing campaigns to lawmakers. This story was originally published March 15, 2018 at 5:20 p.m. ET.